Memphis Light, Gas and Water's Public Education Program (PEP) allows MLGW the opportunity educate adults and children on the utility industry through a variety of forums such as newsletters, community and classroom presentations, Career-on-Wheels participation, Water Pumping Station tours, special conferences and more! For more information on any of these programs, please contact MLGW's Community Relations department at (901) 528-4820 or e-mail commrelations@mlgw.org. The Business of Service Conference provides a setting for ministers and their staff to get to know others, and acquire new skills. The conference is a one-day event held each year in November. The Neighborhood Leaders Conference is an annual event held in August geared towards providing workshops and networking opportunities for neighborhood leaders. MLGW Ambassador Program aims to build sustainable and ongoing relationships between MLGW and key stakeholders organizations. 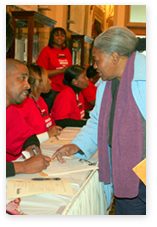 Participating stakeholder organizations have an MLGW employee assigned to answer questions about MLGW services and aid them in getting concerns addressed.